The intention is for OURganic Gardens to become an outdoor green space focused on food, sustainability, and horticulture. We want to provide a standard of excellence in education , experience and training in the northwest of Donegal, giving tourists and the community a chance to learn new and old skills. Our aim is to provide all walks of the community with a sense of ‘connection’ to where our food comes from, to encourage them to become environmentally aware, and to live more self-sufficiently. Our educational packages would provide people with the knowledge they need to make responsible decisions about how they live their lives, while surrounded by the beauty and wonder of the natural landscape OURganic Gardens has to offer. 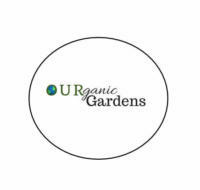 We are at the beginning of our dream at OURganic Gardens and we look forward to you joining on our journey. I was brought up on a small dairy farm in the Yorkshire Dales and I still live in the same village. I am qualified in Agriculture, Horticulture and Conservation and now work in all these areas. I have been growing fruit and veg for many years and joined the BDA in 2011. 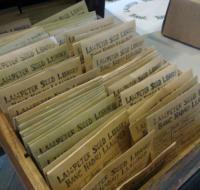 This fostered my interest in seed saving which I am continuing to develop. In 2009 Jane and Tom founded Loaf Cookery School and Community Bakery in Birmingham. 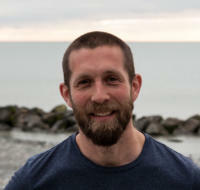 In 2018 they moved to Wales to begin Rye and Roses (Rhyg a Rhosod) a new micro-homestead and family bakery. Rye and Roses are looking to diversify into grain production and particularly looking to grow some of the rarer grain varieties falling out of production in Wales. 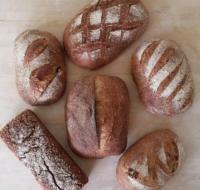 Tom specialises in baking handmade sourdough bread, where possible using organic ingredients and locally milled flour. Jane plans to grow ingredients and grain on a small scale for Rye and Roses. Jane also works part time for Coed Lleol promoting Social Forestry. Together they hope to build an Alan Scott wood-fired oven and move towards becoming a more off-grid business. A completely free public resource, supported by Lampeter Permaculture Group, Transition Llambed and Transition Llambed Development Trust. The library is open at the People's Market at Victoria Hall, every 2nd and 4th Saturday of the month between 10am and 1pm. Members can borrow seed, grow and eat the vegetables and save their seeds at the end of the season to donate back to the library for others to then borrow. Trill Farm is a small scale, organic market garden which grows vegetables for local restaurants. 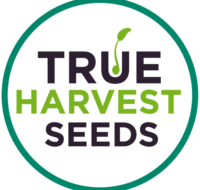 They save seed from around 40 different varieties, producing seed crops for the Real Seed Catalogue, for their own use in the garden, and for exchange through the South West Seed Savers Co-op. 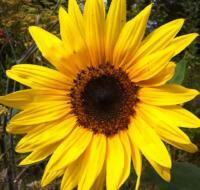 We are an independent organic seed company, specializing in open-pollinated varieties of vegetables, herbs, and flowers. Our long term vision is to develop new crop varieties adapted to temperate organic growing conditions. Sam is a home baker interested in becoming a grain producer. He has been conducting his own small scale trials in three locations on pasture sown spelt (the process where spelt grain is sown directly into pasture and grows to outcompete the grass). Sam feels the implications for pasture sown crops to diversify the Welsh farming landscape are really exciting. He is looking to grow rarer grains for human consumption in Mid Wales. "Einion's Garden is a micro market garden. Established according to the permaculture principles of Earth care, People care and Fair shares, we are improving biodiversity and soil health whilst growing vegetables and fruit for a very local market. In an increasingly unpredictable climate we are learning how to adapt to extremes of weather and are part of a greater movement to building local resilient communities." Einion's garden have been saving seed for their own use for years and are now progressing to producing open pollinated seed for sale. Seed available for the 2018-2019 season: Plas Einion Kale, parentage Ragged Jack/ Red Russian kale. 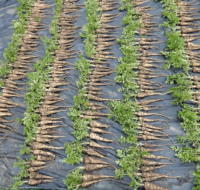 Low growing, excellent clubroot resistance, tolerance of very wet conditions, very hardy, sweet and tender leaves, makes delicious shoots in late spring. Vietnamese Mustard Mr Hong's, mild flavoured, large leaved, pale green with white ribs. Very slow to bolt, even under cover. Melissa grows open pollinated seed for the Real Seeds Catalogue from her ecological smallholding at the Lammas Eco Village, Pembrokeshire. She focuses on tunnel crops such as cucumbers and tomatoes and finds seed production to be a valuable income stream to her sustainable livelihood. Torth Y Tir means 'Loaf of the Land' in Welsh. 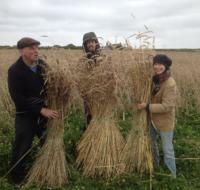 This is a community supported peasant bakery growing a mixed population of heritage wheat. They also mill and bake their wheat into sourdough pizzas and bread. Community owned and run, Torth Y Tir are passionate about ecological production and diversity in their wheat populations. 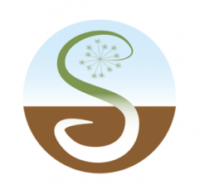 The South West Seed Savers Co-operative are a group of small scale, agroecological vegetable growers who have come together to exchange seed and share their knowledge and experience of seed production. A number of the group produce seed commercially for UK seed companies and others produce seed for exchange and on farm use. If you're a grower or seed business whose interested in linking up with SWSSC then please get in touch! Daniel Blackburn runs his family farm where he keeps sheep and produces vegetables for sale in the surrounding area. 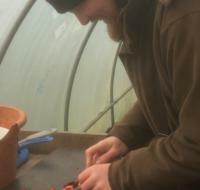 Daniel has been producing seed for the Real Seed catalogue for several years. In the past he has grown large crops of pea seed and this year he is diversifying into courgette and pumpkin seed. Daniel finds seed production to be a useful income stream to the farm as well as something worth doing for the benefit of our local resilience. Blaenffos Permaculture Market Garden has been producing vegetables and fruit for sale to their local community for several years. They are producing seed for the Real Seeds catalogue and save their own varieties to ensure their own seed sovereignty. Lewis Richards is setting up a Permaculture Smallholding where he has planted a diverse range of perennials and established large annual veg beds. Lewis is already saving seed for own use, including rare Welsh wheat Hen Gymro as well as a a broad range of tomatoes including Red Peach, Indigo Rose, St Pierre, Lemon Tree and Sweet Baby. Lewis is taking part in our seed production training this year with a view to produce seed for his wider community in the future. 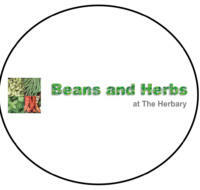 A private herb nursery called The Herbary. Not open to the public except on our special open days. They grow many different sorts of medicinal, aromatic and culinary herbs, using organic and peat-free compost, without the use of artificial fertilisers or pesticides. The land is certified as organic for seed production (vegetables, herbs and flowers) and they have further organic certification for the processing and marketing of organic seed. They have always been committed to safe and sustainable methods of cultivation. Irish Seed Savers locate rare varieties of vegetables, soft fruit, flowers, grains, potatoes and apple trees and then conduct research on them in our gardens. They then select varieties which are hardy and suitable for the local climate. This process takes time patience and skill and then their subscribers, Friends of Seed Savers and the public are rewarded with tasty and productive varieties to grow at home. One of Irish Seed Savers Association’s main aims is to raise public awareness about the vulnerability of Irish agricultural biodiversity to schools and community groups through workshops. They encourage and facilitate liaisons with government departments, universities and gene banks worldwide. 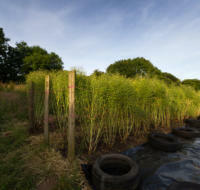 As environmental issues come more the forefront in all of our lives, the small efforts of many make a real difference. 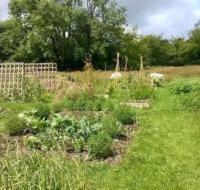 Vegetable, grain and herb seed grown on our family farm in West Cork Ireland. You'll find no F1 hybrids or genetically modified seed here - just varieties that do really well and taste great when grown on a garden scale - a catalogue of real seeds for real gardeners wanting to grow proper vegetables. Because all are open-pollinated (non-hybrid) , you can even save your own vegetable seed for future years, using the instructions we supply. There's no need to buy new seed every year! The Seed Cooperative is growing seed commercially as well as creating a hub for trainings, skill sharing and collaboration. Wayne is supporting growers across Ireland, working under the Irish Seed Savers Association. 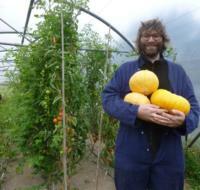 Wayne lives in rural Leitrim with his young family, where he has worked as a Community Organic Gardener since 2006. This diverse role includes growing & selling produce, working with schools, hosting training & events, and co-ordinating a community seed system and its associated website – SeedKeep.com. Maria is supporting growers and crofters across Scotland. She has been working in the Highlands and Islands of Scotland collaborating and advising on seed issues and policy with the Scottish Crofting Federation (SCF) for many years. She organised Let’s Liberate Diversity, in 2012 and advised the RSPB on strengthening the local seed system on the Hebridean islands of Uist. 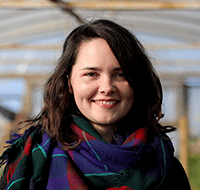 Through Crofting Connections she has delivered educational workshops for schools in the Outer Hebrides to learn about local landraces and seed. Originally from Holland, Maria holds an MSc in Conservation and Utilisation of Plant Genetic Resources from the University of Birmingham. 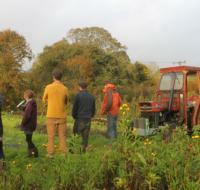 Katie is coordinating the seed sovereignty programme in Wales. She lives in Machynlleth where she has been growing vegetables for sale in a cooperatively run veg box scheme for five years. 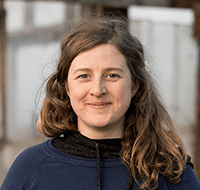 Katie is a co founder of the community organisation Mach Maethlon which works to strengthen food sovereignty in Mid Wales. As part of this work she set up the community growing project Edible Mach and coordinated the running of the growers coop. 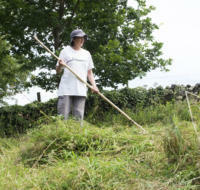 She has been part of the local seed saving movement, organising seed swaps and seed saving workshops in the Dyfi Valley. 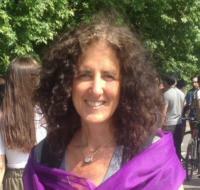 Katie is a Trustee for WWOOF UK and also works in Social Forestry for the Coed Lleol (Small Woods Association). Ellen is supporting growers in the West of England to increase their seed production. The rest of her time is spent market gardening in East Devon where she works for Trill Farm Garden, a small-scale vegetable garden which supplies produce to restaurants and grows seed for the Real Seed Catalogue. Previously, Ellen has worked for the National Institute of Agricultural Botany (NIAB) organising pathology-based varieties trials on broad leaf crops. 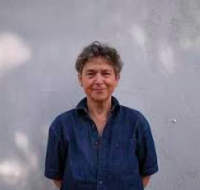 She also holds a degree in Plant Sciences at University of Sheffield, during which she specialised in the effects of low tillage on soil health.